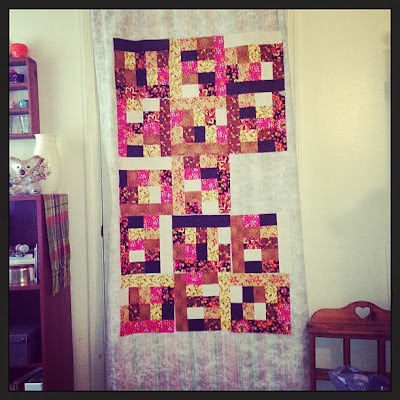 GMHN Quilts by Penny Doucette: My Sewing Space. Cleaned & Organized! 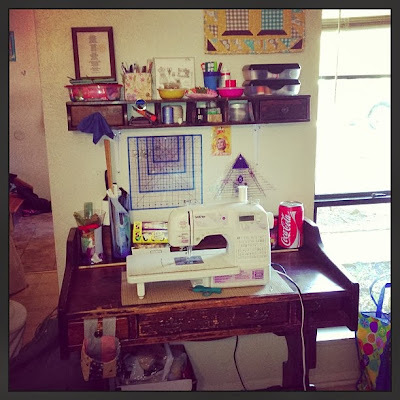 My Sewing Space. 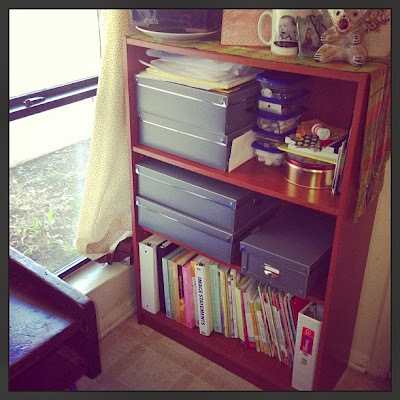 Cleaned & Organized! I have a very small sewing space... I sew in what is supposed to be the dining room and it is about 8 ft by 10 ft. Also, I have one full wall, plus a wall with a door, a partial wall with a window, a missing corner and then the backside of the kitchen which is a see thru wall behind the stove. I have taken a floor plan screen print and added in my furniture! Now when I show you my photos you have something to reference so it makes more sense! 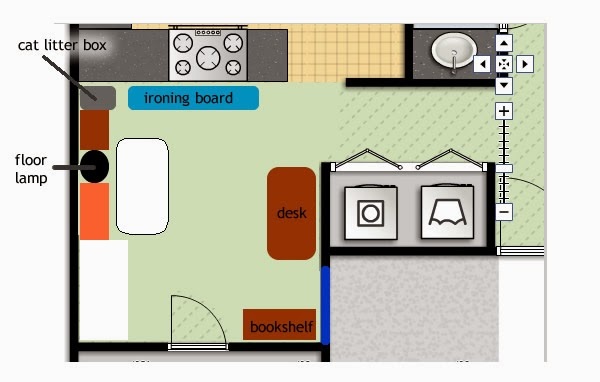 My desk takes up the entire available wall on the right side of the room. 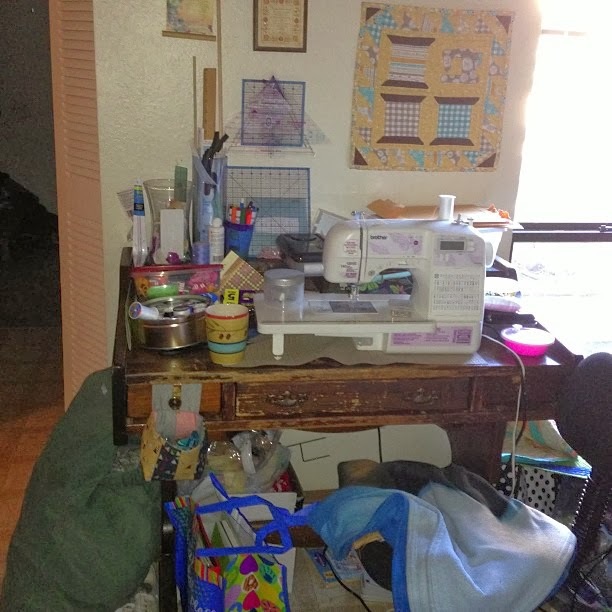 Which, before my cleaning and organizing looked like this! Messy messy!! Tsk tsk!!! Okay you ready... I spent the entire day in that little room yesterday just cleaning and organizing... here is my sewing desk... after shot. What a difference huh!!!?? 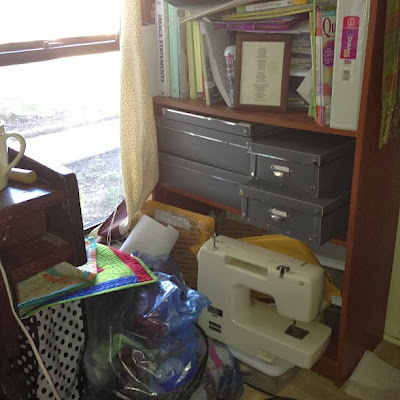 The desk had this small 6 inch deep shelf with two drawers at the back and I tried using it but find when I sew something large, everything gets knocked off the shelf and onto the desk and before I know it I can't even see the top of the desk at all. So I bought some brackets and moved that shelf off the desk and onto the wall and what a huge difference that has made! Next I tackled the bookshelf... and the floor around it! I did not take photos of the rest of the room, but trust me when I say it's super clean and mega organized and I'm thrilled with it. I really am. The after was definitely worth spending the entire day in there cleaning. 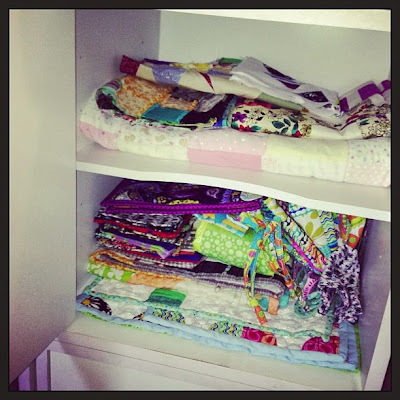 When I was finished cleaning and organizing I started sewing and made a few more blocks for what will be my new quilt for my bed. Fantastic Penny! Go, go, go! Sew, sew, sew!! WIP Wednesday. Will I ever finish this thing? Uncommon Goods. Review & Giveaway. My lame attempt at quilt math. An oldie. But not the first. Lonestar Table Topper - finished!